There are three basic types of windshift patterns that you may encounter on the race course: oscillating, persistent or unknown. When the wind directions shifting back and forth, you should follow all the oscillating strategies. When you’re not sure what the wind will do, you should also use those oscillating strategies. There are two reasons for this: First, it’s more common to have oscillating shifts, so this should be your ‘default’ pattern unless you find otherwise. And second, when you don’t have a great feel for the wind pattern you should be a little more conservative; that’s what oscillating strategies tend to be. 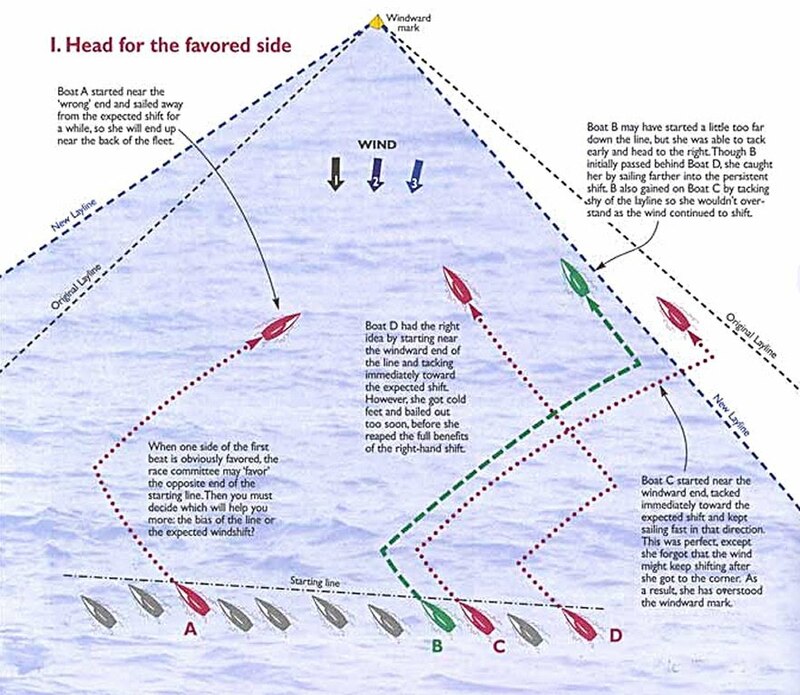 However, when you know the wind will shift primarily in one direction during the race (or during the next windward leg), you need a different approach. Here are some critical ingredients of a strategy for playing persistent shifts. Some elements of your strategic plan are the same for both oscillating and persistent windshifts. The primary rule of thumb is that you should always sail toward the next shift you expect. In an oscillating breeze, the next shift comes from a different direction. But in a persistent breeze, it always comes from the same place, so you end up sailing toward that side of the course. This is also a common strategy in any kind of breeze. When you know you are sailing toward a header, you should sail slightly lower and faster than normal. This will get you to the next shift sooner and maximize your VMG in the direction of the new wind. When the wind is shifting persistently, there is only one way to go on the race course, so you must sail that way at almost any cost. After the start, work hard to get a lane of clear air going to the favored side. If there’s a boat in front of you, try footing off below them instead of pinching to stay above them (see Diagram III). When it’s windy enough that wind shadows won’t hurt you too much, it may even be faster to sail the right way in bad air than to tack and go the wrong way to clear your air. If you are sailing on port tack toward the right side of the course, don’t let a starboard tacker force you to go the wrong way. Instead, maintain a good lookout and plan ahead so you can duck a starboard tacker and keep going right. In an oscillating breeze, you don’t usually want to let other boats cross ahead of you. If they are crossing, it probably means they’re on a lift. Therefore, you should tack ahead and to leeward of them so you sail on the lift and beat them to the next shift. When the wind is shifting persistently, however, throw this rule of thumb out the window. If a boat is crossing you on a lift, it means you are heading toward the persistent shift. So stay on your tack, pass behind the other boat and keep sailing farther into that shift. 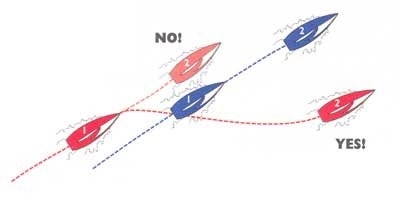 An obvious exception is when the boat that’s crossing you is on or near the layline; in that case you should probably tack to leeward and ahead of them. For many racing sailors, it’s difficult to pass behind another boat on a beat because this is an admission that the other boat is ahead of you at that point in time. But in a persistent breezes you just have to “bite the bullet.” Accept the fact that you’re behind and do your best to catch up. It’s fine to head for the corner in a persistent shift, but you must be careful of the layline. It’s usually better to tack slightly before you reach it. Since you are often far from the windward mark, there’s a good chance that the wind will shift farther before you get there. By tacking early, you avoid overstanding (which can be costly) and also reduce the chance that other boats will tack on you and give you bad air all the way to the mark. When the wind is oscillating, you have to sail your own race. It doesn’t usually work to chase the puffs and lifts that you can see on other boats. 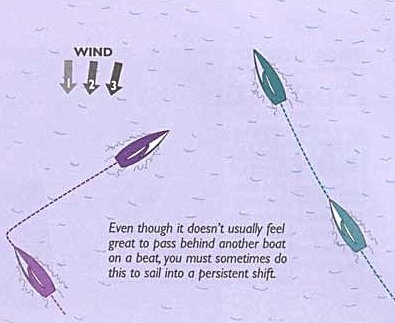 in a persistent shift, however, you should definitely use other boats to help you figure out what the wind is doing. Watch the boats on each side of the course, especially right after the start when you still have the option to go either way. And whenever you cross tacks with another boat, look to see who gained and by how much. This is often your earliest indication about which side of the course is better. When you’re sailing toward a persistent shift, it’s usually better to get clear air by footing off below a boat ahead than by trying to pinch up above them. Stay near the middle - No! Sail the longer tack first - No! In a persistent shift, you should head for a side of the course. If you stay in the middle you will lose ground to every boat that goes farther to the favored side than you do. When the wind is shifting persistently, you normally want to sail the shorter tack first because that will take you into the persistent shift. Once you get close to the layline, sail the longer tack. This is quite different from the strategy you should follow when the wind pattern is oscillating or unknown. Tack on a header - No! Don’t let other boats cross you - No! If you start to get headed it means you are sailing toward the persistent shift, so you shouldn’t tack. When the wind is oscillating, it’s good to tack on a header so you can sail toward the next shift. But in a persistent shift, you will get to the next shift faster if you continue sailing into the header. This is a good rule of thumb for an oscillating breeze because when other boats are crossing you they are probably on a lift. But in a persistent shift, you want to sail farther into that shift, so cross behind the other boat (unless they are on or near the layline). “Cross other boats when you can” is another principle that doesn’t work.